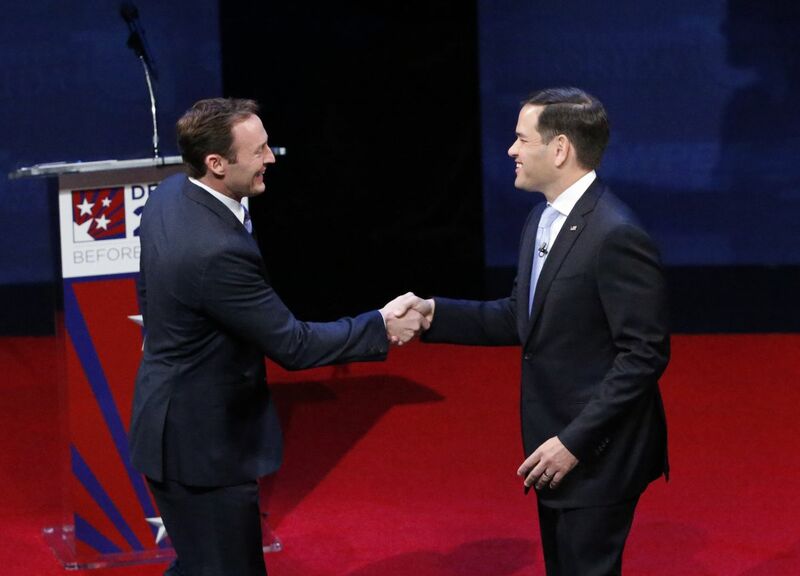 By Joshua Gillin on Wednesday, October 26th, 2016 at 5:35 p.m.
Rep. Patrick Murphy, left, and Sen. Marco Rubio shake hands before the start of a debate, Wednesday, Oct. 26, 2016, at Broward College in Davie, Fla. Rubio and Murphy held their second and final debate, 13 days before the election. U.S. Sen. Marco Rubio and U.S. Rep. Patrick Murphy clashed over Obamacare and each other’s resumes Wednesday in their second and final debate for Rubio’s Senate seat. The pair met at Broward College in Davie with less than two weeks before Election Day. PolitiFact Florida fact-checked statements each candidate made during the event. Here’s our running list of things we’ve examined. Murphy: Rubio had the "worst voting record of any senator from Florida for at least 50 years." Rubio has the highest absentee rate since George Smathers, who left office in 1969. There are plenty of ways to slice the data: Some senators missed more votes overall, and his record is largely in line with other presidential candidates from the U.S. Senate. It’s important to keep those points in mind, but the roll call has been recorded. We rated the statement Mostly True. This is True. At the last debate, Rubio told the crowd he still doesn’t trust Trump with the nuclear codes — he just distrusts Clinton more. Rubio: Fact-checkers have confirmed Murphy "hasn’t had a single contract" to clean up the Gulf of Mexico. Murphy was a small business owner, but the business was owned by multiple people and grew out of a business owned by his father. The business was Coastal Environmental Services, a company formed to clean up the Gulf oil spill. Ultimately the firm only did work in the Gulf for a few months. Rubio: "It’s not a risk corridor, it’s a bailout." Experts have said Rubio is wrong to call the program a bailout, and that the program is supposed to pay for itself through fees from insurers. Furthermore, the program hasn’t been "wiped out." At best, Rubio and Congress have temporarily limited one potential way CMS could have covered insurance companies' losses. We’ll have to see what happens when the program expires after 2016 — then any outstanding bills will be due, one way or another. Rubio: The president was proposing "pinprick strikes" against terrorists in Syria. Rubio is wrong. In reality, Obama said the exact opposite of that, stating several times that a U.S. military response to Syria’s use of chemical weapons on its citizens would involve a significant show of force. "As some members of Congress have said, there's no point in simply doing a pinprick strike in Syria," Obama said in an address from the White House on Sept. 10, 2013. "Let me make something clear: The United States military doesn't do pinpricks." While the president’s full strategy was somewhat unclear, at the debate Rubio echoed Obama’s own past statements that the U.S. military was not built for small-scale engagements that could be characterized as "pinpricks." We rated Rubio’s statement False. Murphy: All of Rubio’s attacks on his resume have "been debunked." Murphy used this line in the last debate, but it still isn’t quite accurate. We’ve fact-checked several attacks on Murphy’s resume, and found some of his opponents have a point. For example, when Rubio previously said, "Murphy embellished, according to reports, his University of Miami academic achievement," we rated that Mostly True. On his congressional office and U.S. Senate campaign websites, Murphy said he had "dual degrees," but he really had a single degree with a double major in accounting and finance. When the Miami Herald/Tampa Bay Times pointed out the inaccuracy, his campaign said it was an error and fixed it. Murphy had also referred to "dual degree" at times in the past while other times his websites reflected a single degree. Other attacks, such as saying Murphy was never a CPA, were incorrect on the details. In some cases, those attack lines have since evolved to be more careful. Murphy: Rubio missed 41 percent of his votes in the Senate. Between March 5, 2015, to March 3, 2016, Rubio missed 41 percent of his Senate votes. Rubio’s absentee rate of 41 percent puts him at the 100th percentile, which means that in that year, he has had a worse voting record than every other sitting senator. In contrast, the Senate median absentee record for the past year is just 1 percent. Murphy’s number is a bit outdated, and Rubio’s absentee rate has since changed. From April to September this year, Rubio has missed three of 113 votes, or 2.7 percent. Rubio: The United States has one of the highest corporate tax rates. We previously fact-checked a statement about whether the United States has the highest corporate tax rate in the world, and found it pretty accurate in 2014. The United States does have the highest statutory rate among developed countries. However, the United States’ corporate tax rate doesn’t appear to be the highest once deductions and other exclusions are taken into account. Rubio: President Obama "was proposing pinprick strikes" for military intervention in Syria. Debate moderator Patricia Mazzei of the Miami Herald noted that Rubio voted against airstrikes in Syria, and asked if he favored committing ground troops there. Rubio said he would support a plan if he thought it would work but didn’t think using American soldiers was a good option. He said he voted against Obama’s plan because he had favored helping factions already in Syria over committing to airstrikes. "He (Obama) was proposing what they called pinprick strikes — basically a symbolic strike to send a message, but not backed up by a clear plan," Rubio said, without elaborating on who "they" were. In 2013, Obama did suggest a limited military response — likely airstrikes from Navy ships — after Assad’s chemical weapons attacks on civilians. Obama only used the word "pinprick" to describe what he didn’t want the attacks to be, and said repeatedly that the U.S. military isn’t built for small-scale action. And while some officials have used the term, "pinprick strikes" aren’t a true military description for any kind of operation.